On 24th November, WeZ kindly invited us to their release event live ‘WeZ presents. [0-QUEST] Tokyo ver. Vol.1’ and took an interview with us. These firm friends plough onwards on their adventure with an admirable optimism, unbent and unbroken by the challenges they face, because they face them all together. Let’s hear what they have to say on the topics of WeZ, theme parks, and what friendship means to them. How did you come to form WeZ? Shogo: At first it was Shiki and I. We were friends at the same university, and I knew that Shiki was already in bands himself, so I wanted to try being a vocalist. Shiki invited me to a session and I gave it a try. 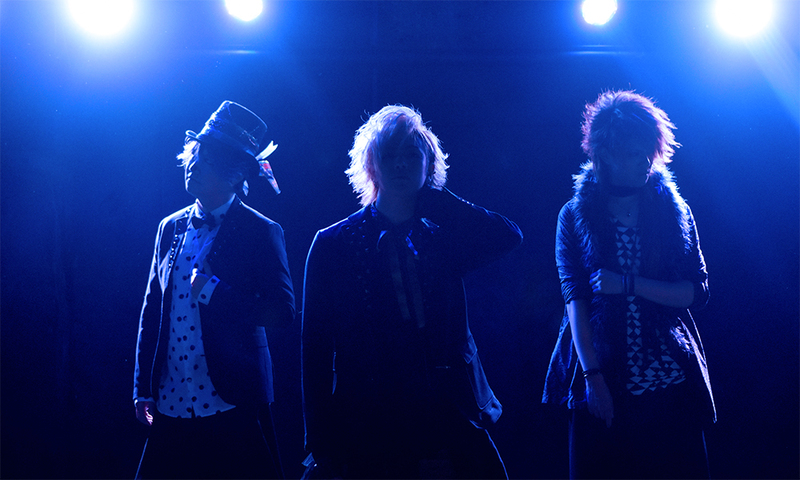 Monyo is Shiki’s older brother, and had also been in bands, so he joined us. Finding a drummer though… that was hard. We searched and searched and couldn’t find anyone, so we tried posting on notice boards and things like that. Eventually we found a drummer who we thought might work on the Nico Nico website where you can upload videos and it just so turned out that the drummer that piqued our interest was at the same university as us. It was Yuki. We contacted him, and met up in the university cafeteria for a meeting about starting a band. He said yes, and that was how WeZ began. Monyo: I think it was because Visual Kei has a lot of unique appeal. It’s not just about expressing music via music, you can also express yourself through your appearance. So that’s why we decided to give it a go. Shiki: I respected a lot of artists that came from Visual Kei originally as well – like X Japan, or Miyavi. Where did WeZ’s name come from? Shogo: WeZ stands for ‘We are Zero’. The number zero doesn’t fade, isn’t forgotten and doesn’t change. Things change all the time, like fashion and music, but the number 0 is a constant. Shogo: 0 isn’t positive, it isn’t negative, it just remains. It persists, like WeZ. Shogo: ‘Music Theme Park’. When we thought about how we wanted to turn out, we realised there’s a lot of genres in music and we just wanted to create something that was like a family. Family doesn’t have a genre – they just are. But in this time where WeZ exists, there are many different genres out there, like jazz, rock, pop, SKA, and we want to try as many as we can. Shogo: Metal! –laughs- that would be different! WeZ’s music is like a theme park with lots of different attractions to enjoy. In a theme park, you don’t have just one attraction, you have many. You’ve got merry-go-rounds, roller coasters, haunted houses… We’re like that – one band with many genres you can enjoy. That’s what we decided we wanted to become. I guess that’s also the subtitle that WeZ has. We are Music Theme Park WeZ. Where do you get your inspiration for your costumes? Shogo: I always design the costumes and make them by hand myself. This current ‘Love Quest’ costume is about adventure. It’s all about expressing that excitement. Right now I have a bat on my head, and it’s not that I’m the hero of the quest and it’s my comrade, but more like I’ve been bitten by the bat on my way through the adventure –laughs- WeZ also has that aspect of joking around in every concept too. For us, it’s not the goal that matters on an adventure, but the path to it. It’s taking that first step, heading out on that adventure that is the important thing, not the winning. That’s what we try to express through our characters. When you make music, what order do you make your songs in? Do the lyrics chose the music or the music, the lyrics? Shogo: First Shiki makes the sound, and then I choose the image to match it. After we have a sound and an outline of a concept, I write the lyrics and then we work a melody around them. It’s whatever fits that we go with. Also Japanese has some very slight, wonderful nuances that makes writing lyrics really fun. So usually our melodies are worked around the lyrics, but sometimes we have songs that start with the melody and the lyrics follow. Either way, our original plan always slowly changes to fit whatever we’re creating. Also, Japanese intonation is really important for the melody and nuance of what we’re trying to convey, and it’s really hard for anyone to pick out the lyrics at a live concert, so if you could listen to the music whilst reading the lyrics to see exactly what we mean, I’d be really happy. So let’s talk a little about your newest release ‘Love QUEST’. What themes do these songs have? Soul∞Bullet is a fight. I guess it’s our equivalent of background music during a fight when you’re playing a game. There are always enemies when you go on an adventure, and for this song, the enemy is one’s self. It’s the theme music for a battle and it’s about overcoming your own enemy. Shinjidai DON’T STOP THE MUSIC is all about friends. It has a samba rhythm for the drums, right? Yuki: Yeah, it’s pretty samba. Shogo: Kind of… don don tsu dan, don don tsu dan… -laughs- Shiki actually wrote the lyrics to this one. Shiki: You can’t go on an adventure alone, and you always need people there. This song is about those friends who are there helping you on your quest. It’s also about picking people up when they’re in trouble, so rallying together as friends. Shogo: It’s also about finding a new era, and entering it. If we had a quest as WeZ, it would be that we are trying to continue on as a band with our music, and we always help each other, so that’s why it has the title DON’T STOP THE MUSIC. Last on the release is Orenji Ashita no Monogatari. It was written imagining dusk, or nightfall when the sun sets. For most Visual bands, this time of day is seen as sad or lonely, but to me, it’s not that, and I wanted to express that feeling. Sunset means that tomorrow is coming, that there will be light again. It’s a positive note meaning let’s head on to tomorrow, together. We can always carry on. As each sun fades, it just connects to another dawn. It also has the underlying meaning that every day is new, with new challenges. What WeZ song do you want everyone to listen to? Shogo: Right now, when taking into account our present situation, we’re all about continuing on down our chosen path, so I’d like everyone to listen to RING!DONG! because it expresses what we are feeling at this very moment. But the song also has the underlying theme that it’s ok to pause for a moment on your way, which is a very optimistic outlook. It’s probably the song that has the lyrics closest to what I’m feeling right now. Monyo: I would like people to listen to anything and everything, really. I just want people to be energetic and happy and just want people, including all the overseas fans, to listen to us and embrace that. But if I had to choose, I would choose Baby Bird, because it says that you should live as fully as possible and it’s a song that, when we play it live, the audience really responds and gets into it for us. It’s a really really fun song, and that’s what WeZ is all about, so I guess you could say that it’s our concept piece. Yuki: I would say Zannen x Love because I like the refrain of this song ‘nandeyanen’ (NB: ‘What the hell?’) and also it has many terms in there that the whole world will recognise, even though nandeyanen is mainly just an Osaka phrase. Also all the fans call out to us during this song, so there’s a real sense of community. Yuki: I think that everyone can listen to and enjoy this song. Shiki: I really like RING!DONG! And Kaito Zero. Our theme is music theme park but our lyrics still have meaning. In these songs, I feel the characters are like something out of Pooh’s Hunni Hunt or the Haunted Mansion at Disney – there’s a lot of appeal in them and it’s just one of our facets. What has been the most memorable live for you so far? Yuki: It would have to be our first Oneman live at Live House D. WeZ was the first band that I’d been in that has always had original songs so it was astounding that we were able to hold a oneman live within 2 months of our formation. I wasn’t nervous at all and because it was a oneman we had a lot of time on stage, so it was really fun! Shiki: It has to be the live we did 2 years ago at our university’s school fair in Kyoto. Visual Kei is really different, and most people had never heard of it, so the live felt really different to when we do lives in livehouses full of people who know Visual Kei. The fact that people stopped by to watch really left an impression on me. Also it was in Kyoto, which is a place I really love, so it was wonderful to be able to perform there. Shogo: My August Birthday Oneman at Shibuya Rex, because the fans really enjoyed it. Oh and the 2man live we did in Osaka with the idol, Mao Ikemoto. That live was really out of our comfort zone as a Visual Kei band, but it was a huge success and the idol’s fans really got into the furi for us. We passed into new territory with that live, which was really interesting. To see both band-girls (NB: Visual Kei fans) and Otaku (NB: Idol fans) interacting together at a live was amazing. It was a new step for Japanese music. It’s really a stand-out attraction in our Music Theme Park concept. Monyo: This isn’t WeZ, per se, but our first live as Zero before we came WeZ really left an impression on me. We had next to no fans, and rather than being disheartened, it really inspired me to keep on trying. For me, it’s not about how many fans we have or how successful we are, it’s the fact that we are willing to keep on walking, to keep on trying that is the most important thing to me. So let’s talk a little about yourselves. What have you become interested in recently? Shiki: I’ve got nothing… I don’t know… my hobby was music, but now it’s my job… Maybe making songs is something I’ve been into lately? But that’s still music. I guess I’ve only got music. Shiki: Oh! I’m looking forward to the release of Monster Hunter Cross! That’s not music! Shogo: You know I can’t eat sushi. Shogo: To be honest, I just really love performing at lives. 2 years have passed since I’ve become a vocalist and it’s my everything. For a vocal, it’s not just singing, you have to be the frontman too. You have to have as much fun as you can on stage to make it felt, and it’s fun trying to be the best vocal performing at the venue on the day. That’s what I always aspire to do, and I’ve going to keep on trying and moving forward towards our oneman in March to deliver the best performance I can… but if you want an answer that isn’t music… phone apps. Yuki: It’s something I put my heart into. Music has really taught me a lot. If everyone continues together, anything is possible. Also these members, they have taught me so much and I’m really grateful. They decorate my day-to-day and really bring it to life. Monyo: It means ‘friendship’, ‘comrades’. Yes, it’s a job, but I wanted to do music as a job forever, and you physically can’t do music alone. You need friends, comrades, people around you. The members, the staff, the make-up artists, the fans… none of this would be possible without them. As soon as you start music, your number of friends skyrocket, and there’s no meaning in music if there are no people. People need to be there to hear the music you make. Shogo: It’s moving onwards in the direction you want to go in. It’s not just a hobby for us. It’s a job, and it’s a product, and it’s life. It’s fun so I wanted to do it as a job, but I soon came to realise that it wasn’t just a job, it was my calling. When it came to me looking for jobs, I had a discussion with a friend about what I should do, and we both decided that I just couldn’t do a normal job as a normal salary worker, so I braved it and took the step to make music my career. It’s my life’s work. Shiki: It’s being together with music and continuing on with each other. Music is something that joins people. No matter who you are, it touches you. Music brings everyone together. Everyone here has met thanks to music. I met an idol, I’ve met other bands, I’ve done so many things all thanks to music. It’s a way of communication as well as expression. With music, you don’t even need language – you can express anything. Where would you like to travel abroad? Shiki: The Louvre Art Museum in France. Because…well, you know the Mona Lisa? How big is it?! Like you see photos and people taking photos and it seems pretty big, but I want to know for myself. I want to find out just how big it is in person. Shogo: I’d go to Singapore, because they really like Visual Kei there and I’d like to go and visit them. Yuki: I’d go back to England. I went there for a homestay when I was about 14 and the scenery was so different and so beautiful that I want to go back. My homestay was in Stratford where Shakespeare wrote his plays when he was alive, and I’d love to revisit it again as an adult. Monyo: -English- I love Japan… -Japanese- Maybe England? Oh, or Italy! As you can see, I really like pasta, pizza, gratin, basil… so I want to go there and try the real stuff! I’ve also always loved soccer since I was in elementary school, and have always played it, so I want to see Italian soccer. That’s why I would like to go to England as well. The Premier League is so good! Shogo: -English- please wait. I will go soon! -all-: Music is a medium without borders and it can spread like wildfire. We want everyone to experience our Music Theme park concept, so, just like a travelling carnival, we’ll get to you one day and, when we do, please come and enjoy yourselves! Wait for us!